This advanced form of the Pureblood Neoshadow can't be knocked off balance, and retains the ability to unleash a shockwave as it resurfaces from the ground. Block when it charges you to earn a few precious seconds during which you can deal double damage. 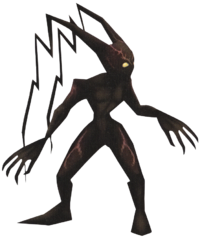 The Novashadow is a Pureblood Heartless that is found in Kingdom Hearts 358/2 Days. A Novashadow has a fairly muscular, humanoid body. Its crooked antennae are quite long and fall back behind the Heartless. It seems to be rather muscular, and its hands are very large, each one sporting four clawed fingers. Its feet, like those of a normal Shadow, are long and lack digits. Its body is mostly a dark brown color, and is also lined by several faint, red veins of color. Despite their apparent large size, Novashadows are only fought when Roxas has shrunk himself in Wonderland, suggesting that they are actually very small. Novashadows are virtually identical to Neoshadows, though they have a different color scheme and four claws instead of five. The Novashadow's name has a similar meaning to that of a Neoshadow. The English word "nova" is derived from the Latin word "novus", which means "new". The Cheshire Cat makes reference to this, during the mission for which the Novashadow is the target, when asking if Roxas and Luxord are looking for the "new shadow". Its Japanese name, "Next Shadow", reflects the fact that it was introduced after the Neoshadow. At the start of this battle, Lock-On to the Heartless and slowly approach it. Prepare to dodge an attack, as it sinks into the ground right off the bat, unleashing a shockwave with a wide range as it resurfaces. As the Heartless proceeds to slowly pace in front of Roxas, begin to attack. Use caution, as it may slash with its claws. However, due to its large size, its claw slashing attack cannot touch Roxas if he is on the ground. These two attacks are the only ones in its arsenal, the tactics used repeatedly throughout the battle. The Novashadow is highly vulnerable to magic, particularly the Aero Spell. Roxas shouldn't have to worry about HP in this battle, as Luxord will heal him in times of need. If his HP does hit the "Alarm Zone," do not hesitate to make use of the Limit Break. Follow this strategy, and the Novashadow should fall in defeat rather quickly. When fighting it again on Day 323, take out the Striped Aria behind it to prevent the constant annoyance dealt by it, then focus on the Novashadow with the same strategy used in Day 255. This page was last edited on 18 October 2018, at 22:06.